Industry leaders have been given a glimpse into the future of tourism in Northern Ireland by a group of talented interior design students from the University of Ulster. As part of their course work they presented representatives from the Northern Ireland Tourist Board and Belfast City Council with their unique ideas to encourage more visitors to the city and beyond. The presentation entitled ‘Tourism 2012’ was organised to highlight the quality of thinking, creativity and entrepreneurship of third year BDes Hons Interior Design students. Raw – Modern Organic Therapies (MOT), a shop and restaurant promoting healthier living. The event was hosted by the University’s School of Architecture and Design and Course Director, Olga Harnett-Makem said the high calibre of the students’ work showed how interior design has advanced over the years. “Interior design continues to mature as a discipline. It is a multi-faceted profession that applies creative and technical skills within a structure to create a unique built solution,” she explained. “Interior designers have the ability and resources to solve problems innovatively while enhancing the user’s quality of life, business opportunities and cultural experience. “In the modern market interior designers help businesses compete, giving them a creative edge and creating new opportunities that engage with the public in a new way to meet modern challenges. Judith Webb, Northern Ireland Tourist Board, Destination Manager said: “I am impressed by the innovative tourism ideas which were presented by these students with such energy and enthusiasm. Dr Nuala Rooney – Lecturer in Interior Design, University of Ulster. The students’ work will be further explored later this semester in an ‘Ideas into Business’ event which is being run by Belfast City Council. 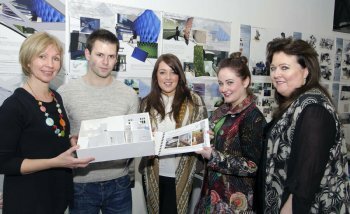 The New Interior Design Honours Degree at the University of Ulster’s School of Architecture and Design began in September 2012. It is a continuation of the traditional 3D Design course and brings together many years of work by the Interior Design staff to promote the innovation taught on the Belfast campus.